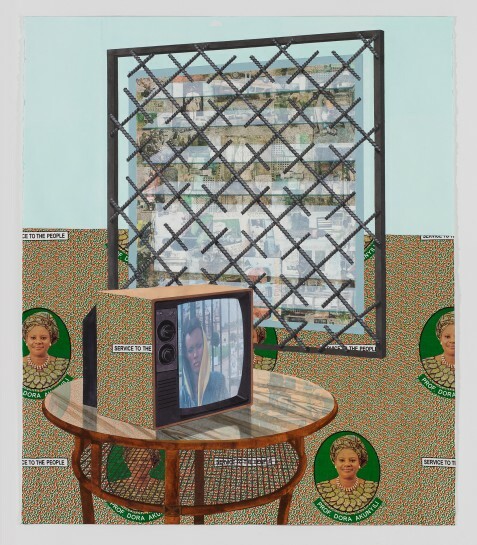 In Massive Paintings, Njideka Akunyili Crosby Pushes Post-Colonial Narratives Forward. Every painting tells a story. The massive paintings of Nigerian, Los Angeles-based artist Njideka Akunyili Crosby—her works stretch more than 11 feet in height or width at times, or more, if you consider her recent billboard commission at the Whitney in New York—tell many. They tell stories of colonialism and cosmopolitanism; they speak in English and Igbo. Just as a story is understood differently depending on where you come from, Akunyili Crosby’s paintings offer different perspectives, depending on where you stand. In her first U.K. solo exhibition this October, “Portals” at Victoria Miro, London, Akunyili Crosby has taken this sense of perspective a step further. She’s delved into what post-colonial scholar Homi K. Bhabha dubbed the “third space”—a liminal in-between where cultures converge, and are conflated. This idea quite literally surfaces in Akunyili Crosby’s many-layered paintings, where the closer you look, the more you see. At a distance, her enormous tableaus are gorgeous depictions of domestic daily life—a young woman seated at a table set for breakfast, or an intimate moment shared between a couple in a living room, for example. But as you approach these paintings, a different narrative emerges: Close in on these works, until your nose almost touches the paper, and you can make out countless images within the images. Akunyili Crosby fills her paintings with acetone photo transfers of Nigerian pop stars, politicians, military dictators, Nollywood stars, and celebrities she would see on TV, growing up in the ’80s, as well as personal snapshots. “The show represents a full year’s worth of work,” the artist tells me. “I’m excited about seeing this much work in one space. It’s really rare to have an exhibition with works that hit different notes, so people see the various aspects of my practice.” She invites visitors to venture through the works as though they were stepping through portals; it’s not a journey into the past or the future, but into personal spaces, at present. “I like thinking of these works as openings into someone else’s life, so you feel invited in to experience a very private moment or space, and I think that enhances the intimacy,” Akunyili Crosby explains. A mesh of old and new imagery, as well as traditional and modern media—in addition to photo-transfers she uses acrylic, charcoal, and colored pencils—process is essential to Akunyili Crosby’s cosmopolitan style. She’s influenced as much by European masters as by the household products that she collects in Nigeria. One gets a very physical sense of perspective through her works; you’re led instinctively to the big picture ideas about the way cultures, histories, and identities intertwine.